I wanted to take Jay’s tutorial a little further, just to see if I could, and to see if I really understood what was going on. You’ll need to watch his video first and continue here for the extras. This is what the starting point looks like (in Windows XP). The first thing I wanted to do was to remove the items dragged from one list to the other, that is, to move the items instead of copying them. x becomes i. I just prefer my loop counters to be i. No real changes here, just the x to i to suit my preferences. The next thing I wanted to do was enable drag and drop both ways. This very easy. Just copy the code from each listbox to the other, so both listboxes will now have code in their DragRow, DropObject and Open actions. The code in DragRow and DropObject is identical for each listbox, so we could move each of them into a method, and let each listbox call the appropriate method. Copy the code from one listbox’s DropObject action and create a Method (click on Add Method). Paste the code into the code window. The method needs to know which listbox to operate on, so lbox will represent the calling listbox, so change all the code references to me to lbox. Finally, replace the action with a call to our new method. And test that the program still works. If not, check back and see if there are any errors that passed the syntax check. Once DropListBoxRow is working for one listbox, replace the action in the other with the new call, and check to see that it works. 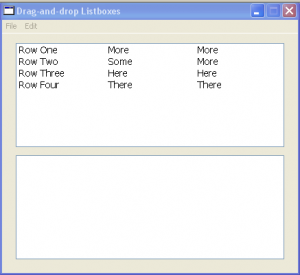 Copy the code from one listbox’s DragObject action and create a Method (click on Add Method). Paste the code into the code window, but remove the return statement. This needs to be retained in the listbox action. The original DragObject action used a DragItem object, so we need to pass this object to our new method, so that it can get at the data that has been dragged to the listbox. The original DragObject also used a row parameter, which we also need passed to our new method. Finally, replace the action with a call to our new method, but retain the return statement. 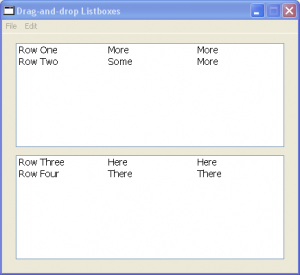 Once you have dragged various rows around between the listboxes they can be a little mixed up. It would be nice if the order of items in each listbox could be tidied up. You could sort them, but if manual reordering is required, then all you have to do is tick to box for the property EnableDragReorder in the control’s property sheet.